Playful Scottie Dog buttery shortbread "puppies", packaged in a convenient resealable bag. pure butter shortbread cookies packaged inside an especially adorable three-dimensional pack. The perfect little size for a great thank you gift or just to treat yourself. Choose between Scottie shaped for your dog's sitter, walker or veterinarian or simple fingers for the piper. Box Dimensions 4" x 3" x 5.4"
The ever-popular Scottie Dogs Shortbread made with chocolate chips !! A chocoholic version of the ever-popular Scottie Dogs Shortbread made with chocolate dough and added chocolate chips !! The best-loved symbols of Scottish food and drink are blended together with the world-famous Glenfiddich single malt and Walkers shortbread for a truly Scottish taste. These luxury cookies baked in the secluded village of Aberlour, in the the Scottish Highlands, using the finest raspberries and large chunks of scrumptious white chocolate. A perfect go together with any coffee or tea. A box of ( 9) is 9.4" x 3.2" x 1.5"
ask us to put a "tester" pack of 2 into your next shipped order ! For only the truest ginger lovers ! Walkers Stem Ginger Cookies are baked to a traditional recipe with generous pieces of whole Buderim stem ginger and candied ginger bits stirred in for good measure. Box Dimensions 9.4" x 3.2" x 1.5"
Sold in a unit of (4) 2 packs. 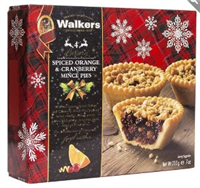 (4) Spiced Orange and Cranberry Mince Pies that are perfectly baked in a crumbly, butter pastry packed with plump, juicy fruits, tangy orange peel and spices baked in Walkers Highland bakery. What's better than an entire litter of puppies ? 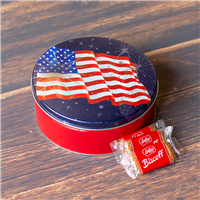 Box Dimensions 9.1" x 8.5" x 1.8"
Tin Dimensions 6.3" x 8.7" x 2.1"
Scottie Dog Shortbread is delivered in this wonderful keepsake tin and is perfect as a gift...whether to yourself or any Scottie dog lover you know. Tin Dimensions 9.2" x 6.4" x 2.1"
Walkers Christmas Tree shaped tin filled with the cutest mini Christmas tree shaped shortbreads ! Made with the Traditional Walkers recipe it's delicious and buttery with a crisp texture. Tin Dimensions 7.8" x 2.1" x 8.7"
Ingredients: wheat flour (wheat flour, calcium carbonate, iron, niacin, thiamin), butter (milk) (32%), sugar, salt. Suitable for vegetarians and certified Kosher OUD. Store in a cool dry place. Tin Dimensions 9" x 8.3" x 2"
Box Dimensions 6.4" x 3.3" x 2.2"
A traditional fruit cake topped with pure marzipan icing made with the tradition of quality Scottish baking dating back to 1898. with no artificial flavorings or additives. Cannot get enough shortbread or Scotties ? This "family" assortment gives you a huge selection of 34 Mini Scottie Dogs, 9 Chocolate Scottie Dogs, 12 Regular Scottie Dogs in a beautiful keepsake tin. 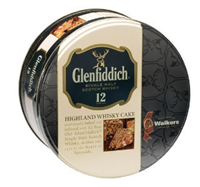 A 28.2 oz.Glenfiddich Highland Whisky Cake in a Tin !! Glenfiddich Whisky Cake has all the flavor of the highlands and is baked using only the finest ingredients. A sought after and prestigious gift !